While cleaning up my computer, I discovered many old projects and experiments long since forgotten. Back in 2007, I decided it was time to get my hands dirty and learn CSS. I read tutorials, books, articles, anything I could find to increase my knowledge of what was fast becoming a requirement for web design. But, as with all things, practice makes perfect. 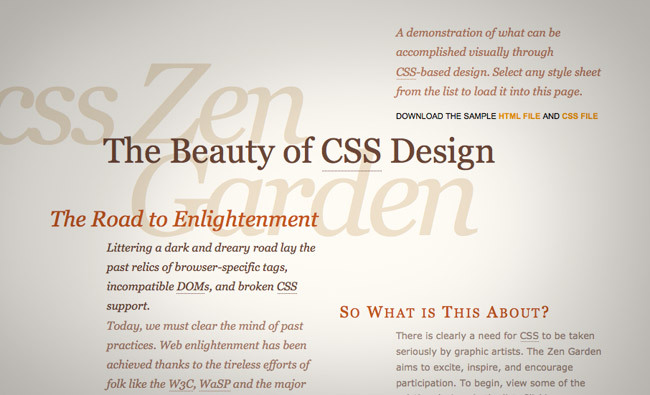 So, I went to the CSS Zen Garden, a project created to demonstrate what can be done with CSS-based design. I looked through the designs others produced, some fairly standard, others quite unique. The one thing I didn’t see was a design that didn’t rely on the use of any graphics. Since this was my first foray into CSS I thought that would be a perfectly limiting challenge. Click on the image to see it in action.